A second half Diego Costa goal gave Chelsea the only goal in a huge morale-boosting victory over a resolute Norwich City side. It was in truth a deserved win for the Blues who were largely dominant throughout and were unlucky not to have scored more, with several chances hitting the woodwork. Mourinho made three changes to the side that last played before the international break, with Branislav Ivanovic entering at right back, and Cesc Fabregas coming in to the middle of the park to join Nemanja Matic. There was also a first Premier League start for Kenedy, usually an attacking player, operating at left-back. As did the rest of the Premier League today, La Marseillaise rang out at Stamford Bridge in a show of respect for those who lost their lives in the atrocities that occurred in Paris last Friday, a gesture that was impeccably observed by all within the ground. It did not take long after the kick-off for Chelsea to show they meant business as within the first 10 minutes they had a couple of decent chances to make John Ruddy in the Canaries goal to sit up and take notice. Eden Hazard was close to connecting with a Fabregas pass which would have left him clean through, and then the combination was reversed which saw the Spaniard scoop over the crossbar. Three minutes later saw what would have been a wonderful goal, scored by John Terry of all people. A magnificent piece of skill nearly saw the skipper score a beautifully audacious backheel volley from a corner, but instead it clipped the side netting. Norwich did however have chances of their own and looked quite a threat on the break, with Martin Olsson and Nathan Redmond particularly looking very pacy on the counter. It was Redmond who had Norwich’s first chance, and it took a smart Begovic stop to deny Norwich taking the lead. Dieumerci Mbokani should have done much better from a later effort – with enough time to take a touch inside the area before shooting, he could only drive his effort over the bar. 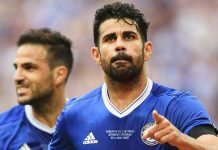 Diego Costa and Fabregas had good chances to score as the former fired over the bar with an effort he should have scored, and John Ruddy was equal to Fabregas’ rasping effort. There were shouts for a penalty before the half was up as Diego Costa was felled but the referee saw no infringement much to the home fans chagrin. There was one final effort for Costa before the half but it came to nothing. The second half started much like how the first wore on, with Chelsea applying the pressure but Norwich coping fairly well with what was coming their way. Willian and Zouma both had opportunities which were dealt with, but it was definitely looking like a matter of time until we broke through a stubborn wall of green and yellow. On 63 minutes, we finally managed it. A smart dink of a free kick from the impressive Fabregas was met by an equally impressive Costa who finished with great aplomb in what was the only goal of the game. Moments later Kurt Zouma nearly doubled the advantage but his volley from Willian’s free kick smashed against the bar. Pedro narrowly missed out too, missing the top corner from a relatively acute angle. Nemanja Matic almost scored what could have been the goal of the season so far as he embarked on a 30 yard run, taking on defenders with an ease more akin to his more creative counterpart Eden Hazard, but could not apply the necessary finish. Chelsea dug deep for the final few minutes and held on for a massive victory, made all the more important as the day’s fixtures transpired and Arsenal and Manchester City were both defeated. The gap is now 12 points to them in 3rd and 4th respectively thanks to their defeats and our victory. Leicester City are improbable table toppers after their win against Newcastle, a further two points clear. Manchester United are a point behind in 2nd, as we currently sit 15th. Our next game is away to Maccabi Tel-Aviv in the Champions League.